February 14, 2636. You are about to learn what it takes to be a descendant of command legends Scorpion and Mad Dog. That is, now that the Red Falcon would like to use your family tree as a toothpick. You're Jimbo and Sully, special forces comrades just like your fearsome forefathers were. Nowadays, your weapons and maneuvers are more advanced than they were when your ancestors saved the world from being skewered on Red Falcon's fangs. That brutal is still in his prime and he had plenty of time to plot his revenge. He's swamped Neo City with six stages of the most cruel and unusual punishers ever. So run, climb, ride, soar and start blasting your way to the Alien Main Base. Before your family name and your planet are just dirt under Red Falcon's claws. --From the Gameboy Contra The Alien Wars instruction manual. Play Contra The Alien Wars Now! 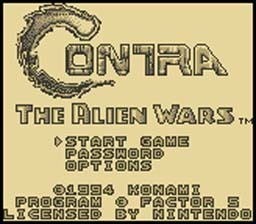 Contra: The Alien Wars was based on the SNES Game Contra 3. The Alien Wars was a fun game all around. You did not have near the options you did with the SNES, but for a hand held it did fairly well. The graphics are kind of a let down and the sound could be a little better, but it's not bad. The premise is the same as the SNES version, the same storyline is used for both. Other than that it is your basic Contra game, kill or be killed. So good luck and have fun playing Contra: The Alien Wars. Run and blast, those are the rules, but mainly blast. Enter B32R as the password.